In Greek mythology, Atlas was designated to hold up heavens for eternity. Much like this myth, the Volkswagen Atlas strives to uphold the highest standards for their customers, and it doesn’t get much better than the heavenly interior of this vehicle. To give you all the details you crave, Metro VW has created this 2019 VW Atlas interior review. Drivers in the Irvine, Grapevine, and Dallas areas can now find what the inside of this SUV has to offer and let us tell you, it’s quite a lot. To begin, we’ll break down all the ways the 2019 VW Atlas is going to make your drive as comfortable as possible. Getting cozy has never been so easy with the available V-Tex leatherette seating, which is highly stylish and easy to clean. In the front, the driver will settle down in the available heated, power-adjustable seat with memory and lumbar support, ideal for customizing to the most functional and comfy position. The second row comes equipped with 60/40 split folding seating with available captain’s chairs. Not only do these offer more space for each passenger, but they can also fit up to three child seats. If your family is growing, you won’t believe the ease that this offers. Finally, the 50/50 split-folding third row can seat up to two (making the total passenger capacity a whopping seven). Available with easy access, all the passenger needs to do is simply push up the second-row seat and hop right in! Owning an SUV means you better have a ton of room in the back, and the Volkswagen Atlas does not skimp on cargo space. It doesn’t matter whether all your seats are full or you’re traveling by yourself, you won’t have to leave anything behind. Get the most space possible when you fold down the second- and third-row seating. 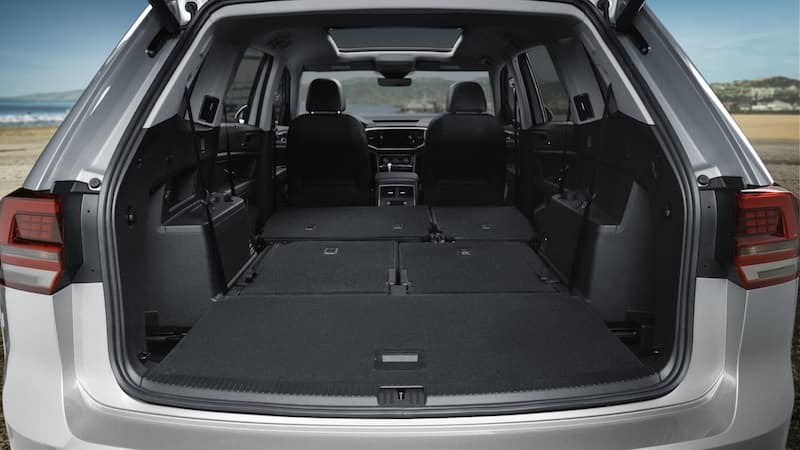 By doing so, your VW Atlas will completely transform, allowing you to utilize an incredible 96.8 cubic feet of cargo. Go ahead and pack it up, there is plenty of room. With the ability to seat seven passengers, the VW Atlas ensures that you remain connected and entertained on the go. Inside the VW Atlas, you’ll find a suite of available tech that is innovative, easy-to-use, and downright awesome. 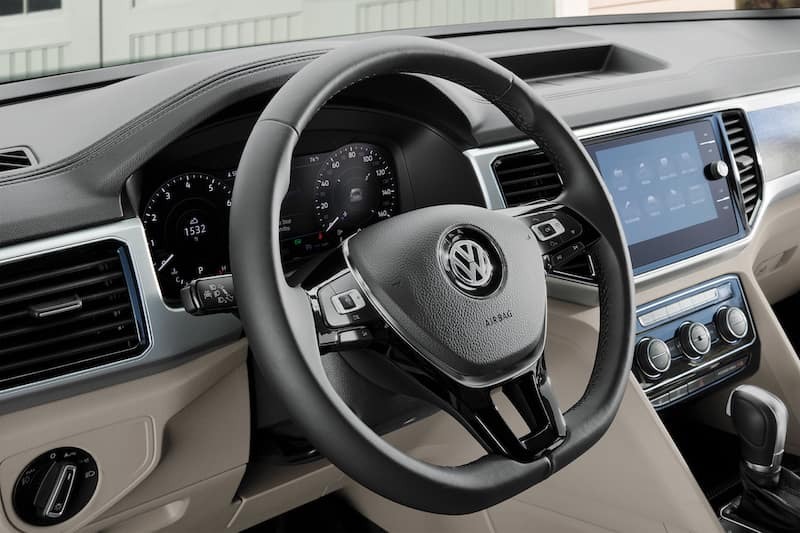 Now that you have read our 2019 VW Atlas interior review, are you ready to experience it for yourself? 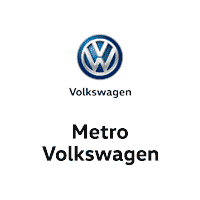 Grab the family and come on in for a test drive. Customers in the Irvine, Grapevine, and Dallas areas can easily schedule a test drive by contacting our dealership today.